THE parents of West Belfast’s own ‘superhero’ Dáithí Mac Gabhann say they are more determined than ever to highlight their campaign and “help normalise the talk about organ donation” following the toddler’s recent transplant re-assessment. Dáithi’s parents Seph and Máirtín travelled with their son to Freeman Hospital in Newcastle last week were they spent three days, as Dáithí underwent numerous tests. It was discovered during a routine 20-week scan that little Dáithí’s heart had not developed as it should have and it was found that the now two-year-old toddler had hypoplastic heart syndrome. At only four-days-old Dáithí travelled to London where he underwent open heart surgery. Six days after that he underwent his second open heart operation. Máirtín described the stay as a “hard week” for his family and told the Andersonstown News that although Dáithí’s heart function hasn’t declined, there had been slight damage done to his kidneys due to the high dosage of medicine the Ballymurphy toddler has to take. “It was a hard week for Dáithí, it was a hard week for us as well,” explained Máirtín. “There were constant needles, test after test for Dáithí but we got through it. The staff were amazing and the cardiologist seemed happy with Dáithí’s heart function but noticed some kidney damage. “Dáithí takes medicine for his heart, to help him go to the toilet; he takes aspirin, around 80 doses of medicine in total a week. The hospital will be keeping an eye on it. Dáithi’s heart function is okay at the minute and he is stable. Since the family’s ‘Is Deontóír Mé/Yes I Donate’ campaign began back in July, launched by Lord Mayor Deirdre Hargey, there has been an increase of four per cent in the number of people in the north who have opted into the organ donation register. Máirtín stressed how transplant is not a cure, but a last resort when all other options have been exhausted. “Seph and I came back from Newcastle saying we had to up the campaign, we have to keep raising awareness. When we were over we had to sign consent forms for the heart surgery for when Dáithí receives his gift, for the surgery to go ahead. You are basically siging a consent form with a list of risks and the first thing that it states is ‘death’ in capital letters and that’s jumping out of the page. “You don’t want him to get worse but he is going to get worse,” added Máirtín. “While organ donation as a whole is up, hearts for children are down the last two years and that list is going up. As I said transplant is not a cure, transplant give you time. Everybody is different; the first transplant baby in the UK is now in her 30’s. The anxiety that Seph and I have will probably never go away. The last two years have been some of the best and worst times of our lives. We love Dáithí so much and will do anything to get as much time with him as possible. 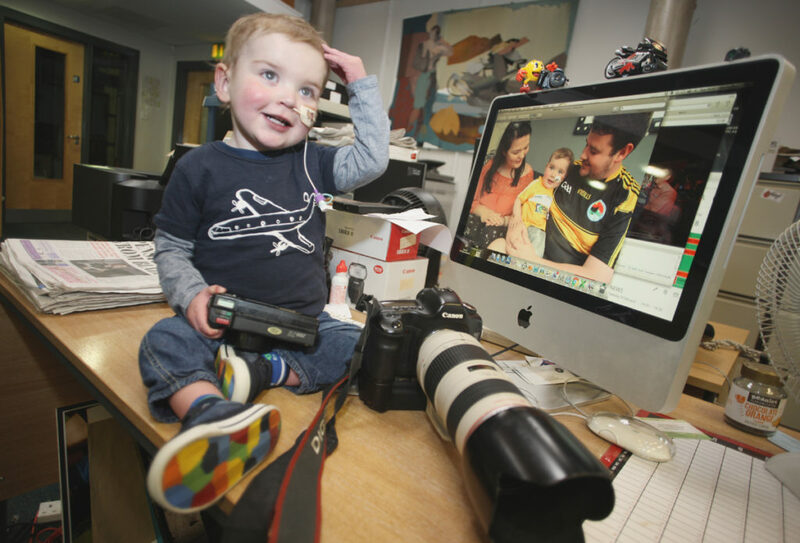 “We have put down hurdles, the first was getting to Newcastle, the second was getting Dáithí assessed, the third was getting him accepted onto the organ list and the next one is getting him a new heart. There will be lots after that but we’ve been taken it one wee step at a time. We would rather be on that rocky road than no road at all,” he said. A family health morning will take place on Saturday February 16 from 11-2pm as part of Heart Awarnesss month at Glór na Móna.